McMaze is located on a working farm, and has many activities to entertain both adults and children. As the name implies, they have several mazes on the property, the largest being their corn maze, which changes every year (this year’s theme is Canadian Symbols). The maze is very relaxing – it’s more about enjoying a walk through a corn maze than actually getting lost. There are other smaller mazes throughout the property, including a switchgrass maze, a haze maze (an indoor maze with lights and fog), and a doors maze (an indoor maze with 52 doors). You can also visit the mazes at night – just remember to bring a flashlight! Besides the mazes, there are a number of farm-based activities to enjoy. There’s an Agricultural Education Centre in the barn, farm animals to visit, and even regularly scheduled pig races! When I visited, there were also numerous kitten and cats running around, and some puppies in the barn. McMaze is also known for its Halloween activities. For 6 nights each year, McMaze offers “Haunted North”, a frightening experience that includes a wagon ride, Haunted Bush Walk, and a very scary walk through a old farm house. The co-owner, Valerie McDonald, gave me a tour of the house when I visited last year, and it was definitely scary even during the day! Picture an old, abandoned farm house in a field – that’s what you’ll be going through in the dark, with 30 high-school actors ready to jump out at you at any time! If you want to experience Haunted North or its daytime activities, you’ll need to go before McMaze closes on October 31st. 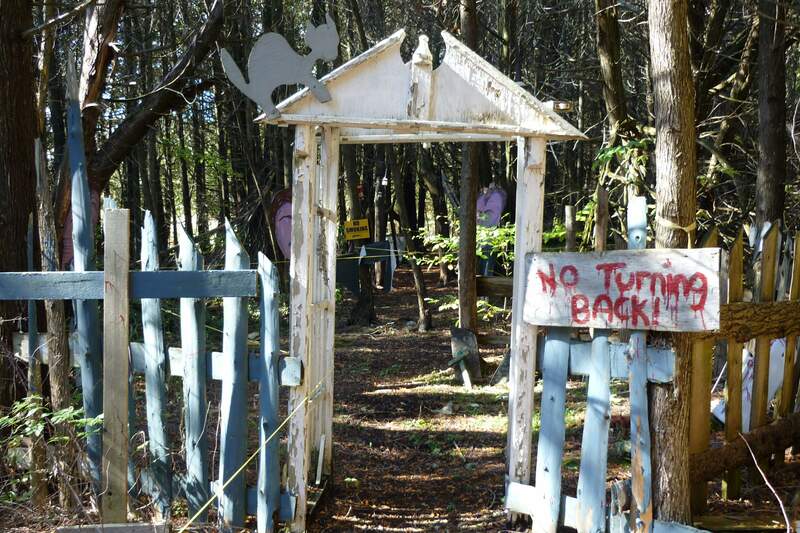 Haunted North runs tonight (Friday) and Saturday, and the daytime activities run until Monday. The cost is $15 for Haunted North, $12 for the daytime activities, and $20 for a combination ticket. You can buy your tickets online or at McMaze. After the regular season is over, McMaze offers horse-drawn sleigh rides by reservation in the winter, and an Easter Egg Hunt in the spring, followed by their regular summer and fall activities. For more details, see the McMaze website, which has photos, videos, and lots more information to help plan your visit. Hours: Varies depending on the season. Open daily during October. See McMaze website for details. Reservations: Not required, except for groups (group discounts available). Nearby: While you’re in the area, you might also want to check out Strathmore Orchard and Winery in Monkland, Domaine du Cervin Winery in Chesterville, and Avonmore Berry Farm in Avonmore. Is my ball in here?